Porsches are our first love! 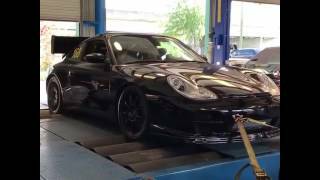 Engine Lab of Tampa specializes in the service and maintenance of all Porsche automobiles, from the 356 to the Turbo Carrera. We can help you get the most out of your Porsche engine, for the maximum performance, fuel efficiency, safety and life. We give you sound information about the condition of your Porsche automobile and what your repair and maintenance options are. Then you can make intelligent decisions as to what you need to do to keep your Porsche performing as the manufacturer intended – or better! Doug Amorosa's 1999 Porsche 911 Carrera 3.4L track assassin! For a 1999 car is in fantastic condition and is a real beauty. Engine Lab added the GT3/X51 style center radiator's to keep this monster cool on the racetrack. 2014 Porsche Panamera with blown-out coolant hard pipes. Factory pipes were glued in and are failure prone. We updated them using bolts for a more secure join. This is also a problem on Porsche 911/GT3/911 Turbo/996/997.